The price of oil appears to have bottomed out in early 2016 and has been steady around USD 55 per barrel Brent since Q4 of 2016. This has been driven by rising demand, OPEC’s decision to curb production, and resilience in the US shale sector. Oil prices are expected to stay steady around USD 56 until 2018 when demand is forecast to begin exceeding supply, lifting the price more rapidly to USD 79 per barrel by 2020. Should investment in new projects remain subdued for a third year in 2017, there may be a significant upward price shock and short-term. Downside risks stem from a persistent supply glut, either from US policy or OPEC’s failure to follow through on the agreement to cut production. 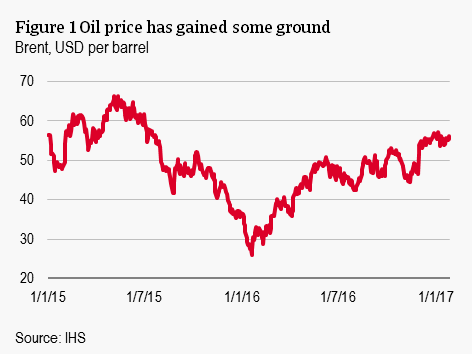 The price of oil has been relatively stable since Q4 of 2016, considering the volatility seen over the past couple years. From a low of USD 27 per barrel of Brent crude oil, the price has held steady around USD 55 per barrel since December 2016. Low oil prices have spurred demand in many advanced economies, while this has been partially offset by lower demand in emerging markets where many expensive fuel subsidies have been eased. The latest price developments still appear to be mostly driven by the supply side. OPEC cuts production. In November 2016, OPEC announced that it would cut production in order to rebalance the oil market, the decision coming into effect in January 2017. This marked the inevitable end of their previous policy which focused on maintaining market share and was a primary contributor to the supply glut experienced since 2014. Production cuts, averaging 4.5% for each member (with the exception of Libya and Nigeria), have also been coordinated with eleven other non-OPEC producers like Russia, Mexico and Oman. This policy shift motivated a rally in oil prices to current levels, thanks to the clear move to address the global oversupply. US oil sector proves resilient. With prices bottoming out and the shift in OPEC policy, the outlook for US shale has become more positive. With higher prices, more expensive oil resources become more price-effective. This is reflected already in the number of oil rigs operating in the US which has been on a steady upward trend since May 2016. Despite a sharp contraction of 80% from the peak of oil rigs in operation, production has only fallen less than 19% in the same period. The perseverance of American oil production has: (1) seen a slow rate of decline in production from wells already in operation, (2) increased efficiency and profitability of wells, and (3) resulted in a vast inventory of drilled but uncompleted wells (DUCs). The collapse in oil prices since 2014 has been driven primarily by oversupply. As shown in Figure 3, world production has largely exceeded global consumption since the beginning of 2014. This has led to a large increase of oil in storage. In Q3 of 2016, consumption exceeded production slightly and the net change in oil stocks was negative for the first time since late 2013. 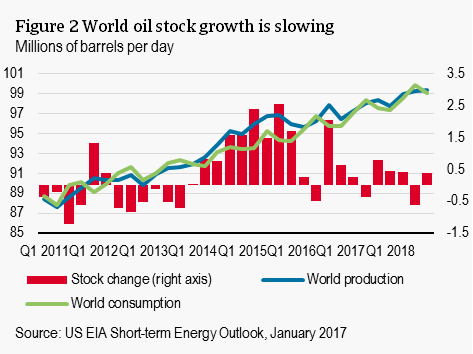 A sharp accumulation of oil stocks came again in Q4 of 2016 as many OPEC countries ramped up production ahead of the implementation of the cuts. The US Energy Information Administration (EIA) projections presented point to much closer production and consumption levels than that experienced over the past two years. In line with EIA expectations, we expect that the oil market may finally rebalance in 2018 with demand exceeding supply from then on, driving a price recovery. The price recovery is likely to be only gradual in the short term though. The EIA forecasts Brent prices to average USD 53 per barrel in 2017 and USD 56 per barrel in 2018, broadly in line with futures quotes over the same period, averaging USD 56 per barrel over the coming two years. The price is not forecast to increase much in the short term since there is a supply overhang from the large inventories stocked up during the glut. A dynamic US oil sector will also act as an upward limit to oil prices, but due to bankruptcies in the sector and time needed to repair balance sheets, supply will increase relatively slowly. The commitment to production cuts by OPEC and other major producers should also act as a floor under the price. On the demand side, higher demand in reaction to the lower prices places upward pressure on prices. However, expectations of rising oil prices and a stronger USD (which makes oil imports more expensive in local currencies since it is priced in USD) are also slowing growth in demand. From 2018, the price of oil is expected to begin increasing more rapidly, reaching USD 79 in 2020. The rapid price increase would be driven by higher demand than supply and another period of short-term volatility could arise. One major driver here is the lack of investments since 2015. In 2015 and 2016, investment in new oil projects declined. Supply has held through this period and is expected to continue in 2017 as projects long in the making come online. But it is bound to feed into lowered production in 2018. Lower OPEC production should also help speed this shift in supply. Higher demand – particularly from emerging markets like India and China where high population and GDP growth are fuelling higher demand for vehicle fleets – will also push up prices. In the medium term, the pace of demand growth will slow, largely due to the effects of new national policies under the Paris Agreement to curb carbon dioxide emissions. Along with the price rebound, investment opportunities will grow, especially in unconventional sources that depend on higher oil prices. Production growth will be concentrated in nonconventional sources in the US (shale), followed by Canada (tar sands) and Brazil (deep water). In the longer term, as the easily accessible oil is depleted, higher investment in traditional fields in OPEC will drive production growth from those countries as production in non-OPEC producers stagnates. 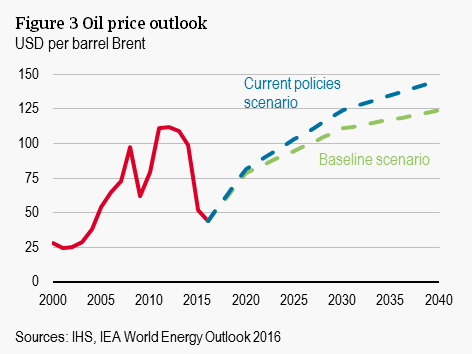 Predicting the future price of oil is notoriously difficult. In the short term, supply and demand are highly inelastic and do not respond to prices, as demonstrated by the recent persistence of the supply glut through the price collapse. That is why a look to the fundamentals of supply and demand is needed to predict the most likely scenario for prices. Going forward, it appears that a sharp rise in prices is the primary risk, while a new normal of very low oil prices is waning – though is not entirely off the table. The main short- to medium-term risk is a failure of investment to pick up. Extensive modelling by the IEA shows that there is reasonable scope for production to recover in a stable fashion following two years of suppressed investment. The outlook becomes subject to significant uncertainty. Another year of low investment may warrant large upward price shocks to bring down demand. With oil prices staying stable above USD 50 since Q4 of 2016, increasingly more firms appear likely to increase capital expenditures, which makes the probability of a sharp upward price adjustment increasingly low. Downward risks to the price cannot be ruled out though. One such risk is the ‘Trump effect’, should the new administration follow through on its promises to deregulate the energy markets. While this is not yet formally incorporated into our baseline scenario since the actual policy direction is highly uncertain, it could put downward pressure on the oil prices since the US accounts for nearly 14% of global oil production. A perseverance of the supply glut stemming from the failure of OPEC to cut production would also leave prices lower for longer. The agreement also exempts Libya and Nigeria due to recent unrest there. If the situations in these countries stabilise, production may significantly exceed expectations.